- - - São Paulo - The Golden Tulip Paulista Plaza is a 4 star hotel in the Jardim Paulista area of São Paulo, Brazil. This stylish district has an array of top-notch restaurants and many different shops, ranging from large shopping centres to jewellery shops and fashion boutiques, most of which are found on the Rua Oscar Freire. Nearby on the Avenida Paulista, you will find the Conjunto Nacional, a large building with restaurants, a cinema and one of the largest bookshops in Latin America, the Livraria Cultura. As well as a central location, this modern 24-storey luxury São Paulo hotel offers deluxe accommodation and a myriad of high-quality services which are guaranteed to make your business trip or holiday in São Paulo a resounding success. Guests at the Golden Tulip Paulista Plaza Hotel are in for a real treat, as the hotel's facilities allow you to keep fit, eat well and carry on working in style. At the hotel you can taste the finest French pastries and a unique fusion of Brazilian and French cuisine at the hotel's café and restaurant. 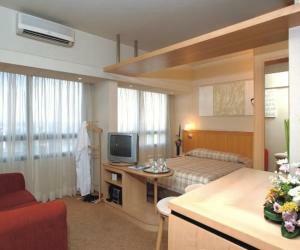 To burn off all those calories, there is a state-of-the-art fitness centre, 2 outdoor swimming pools, and a sauna too. Free wireless internet access is provided in the hotel lobby and a fantastic range of conference rooms are available for hire.